One of London's most famous attractions, Big Ben, is celebrating 150 years of keeping time. The clock tower in Parliament Square, is being cleaned after a year of activities for the landmark, which started ticking on 31 May 1859. 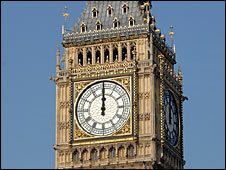 Technically Big Ben refers only to the clock's largest bell, but has become synonymous with the clock tower itself. The bell, cast in Whitechapel on 10 April 1858, was first rung in the Great Westminster Clock on 11 July 1859. "It's a typical piece of Victorian engineering," said Mike McCann, the keeper of the great clock. "It will last for hundreds of years. Mainly we wind it three times a week. It is clockwork. "A lot of people seem to think that it's some sort of electronic clock but it's entirely clockwork, driven by weights which need winding. "So the main maintenance work really is winding it three times a week, oiling it and keeping it accurate." The clock tower and the new Palace of Westminster, designed by Charles Barry, were built after a fire destroyed much of the old Houses of Parliament in 1834. Last year, Big Ben was named Britain's favourite attraction in a poll of more than 2,000 adults.